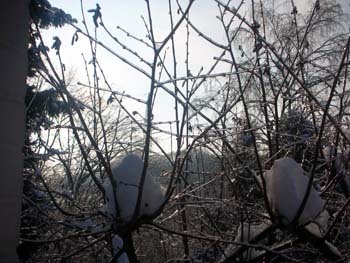 December 25, 2010, winter in Europe. • Please click here to see more photos from Evelin's camera. 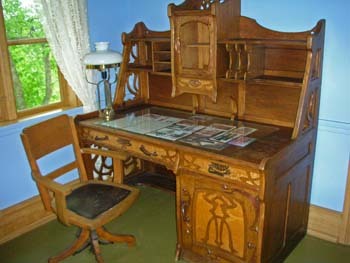 • Please click here to see more photos from Van Billings Harris's camera. 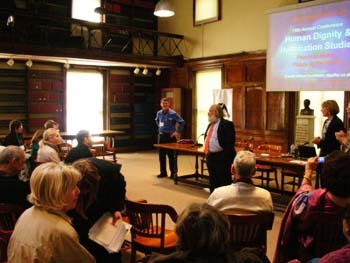 Morton Deutsch is the honorary convener of our workshops. 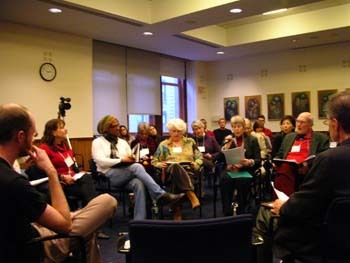 He is the founder of the International Center for Cooperation and Conflict Resolution (ICCCR), our host at Teachers College, Columbia University, New York City. 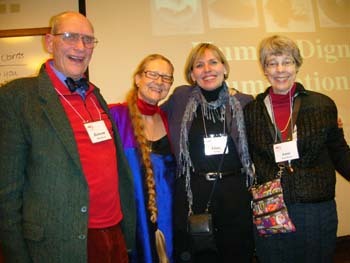 In 2009, we celebrated his influential, important, and eminent life and life-work with the first life-time award of the HumanDHS network. 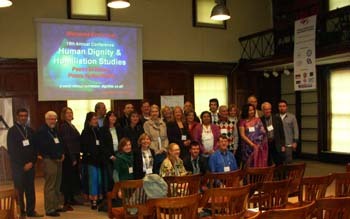 Pictures of all of Day One of the workshop, Thursday, December 9, 2010. 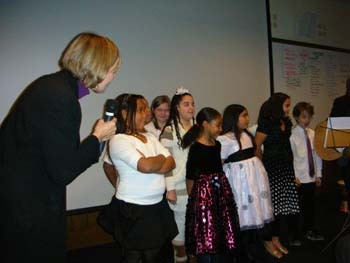 • Please click on the picture or here to see more photos from Evelin's camera. 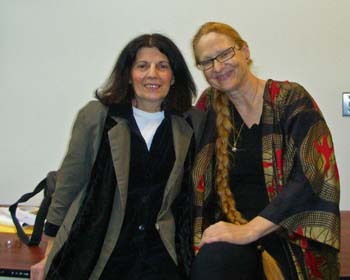 Thank you, dear Van, for taking such great pictures! 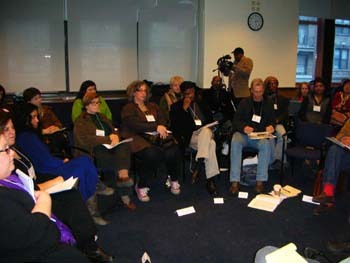 Round Table 1 on Day One of our workshop, Thursday, December 9, 2010. • Please click on the pictures on the left or here to see more photos from Evelin's camera. 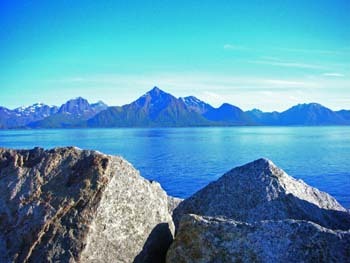 • Please click on the picture on the right or here to see more photos from Van Billings Harris's camera. 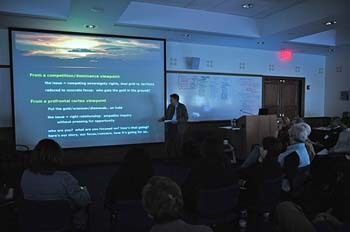 Public Event on Day One of our workshop, Thursday, December 9, 2010. 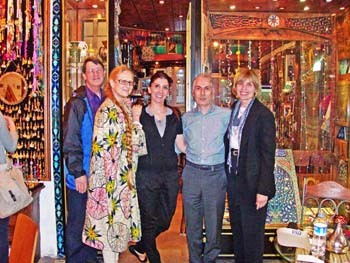 In the spirit of our motto of Unity in Diversity, we opened the evening with music from Iran, by Aida Shahghasemi, and closed with Fred Ellis's children from many cultural backgrounds. • Please click on the picture on the left or here to see more photos from Evelin's camera. 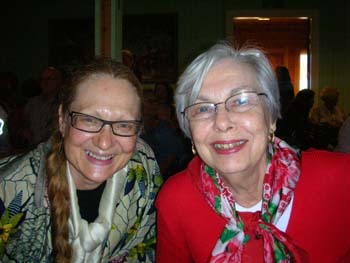 • Please click on the picture on the right here to see more photos from Van Billings Harris's camera. 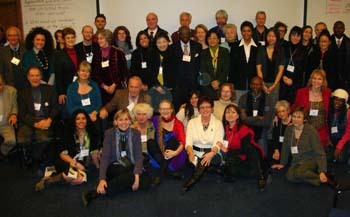 Pictures of all of Day Two of our workshop, Friday, December 10, 2010. 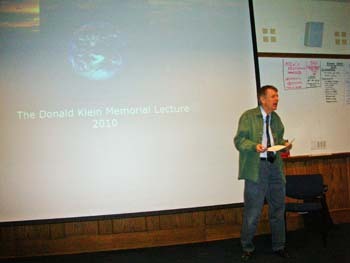 Michael Britton gave the Don Klein Memorial Lecture on Day Two of our workshop, Friday, December 10, 2010. 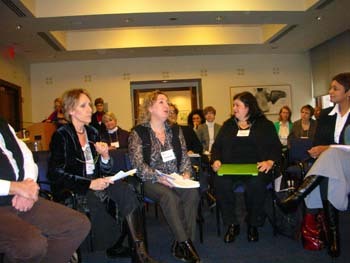 Round Table 2 on Day Two of our workshop, Friday, December 10, 2010. 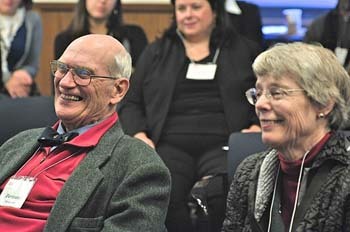 Anne and Bertram Wyatt-Brown received the HumanDHS Life Time Award on Friday, December 10, 2010, on Day Two of the 2010 Workshop of Humiliation and Violent Conflict! 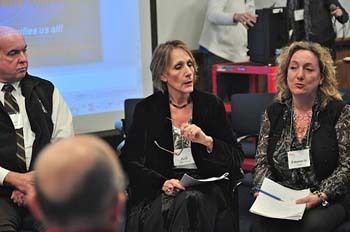 Round Table 3 on Day Two of our workshop, Friday, December 10, 2010. 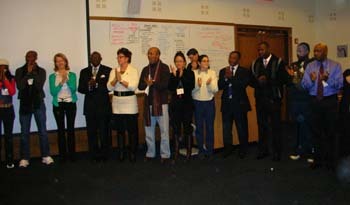 December 8, 2010 pre-workshop meeting: We were kindly invited to the Conflict Resolution End of Year Holiday Party, sponsored by the Advanced Consortium for Cooperation, Conflict and Complexity (AC4) and supported by The Masters Program in Negotiation and Conflict Resolution at Columbia University, the Center for International Conflict Resolution at SIPA (CICR) and the International Center for Cooperation and Conflict Resolution at Teachers College (ICCCR). 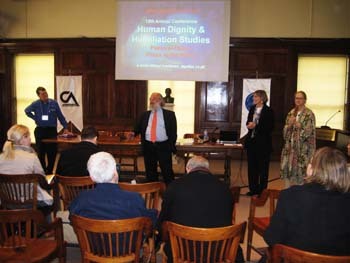 We thank Peter T. Coleman for making our annual "Workshop on Transforming Humiliation and Violent Conflict" possible. 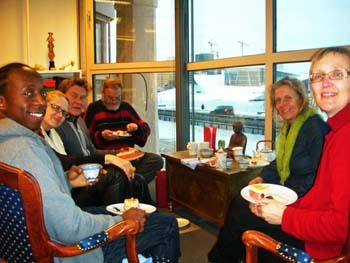 December 11, 2010, first post-workshop meeting. 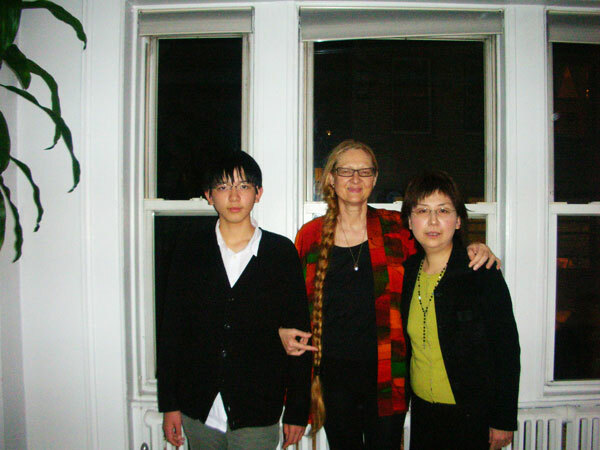 December 12, 2010, second post-workshop meeting with Tomoko Ishii and her son. 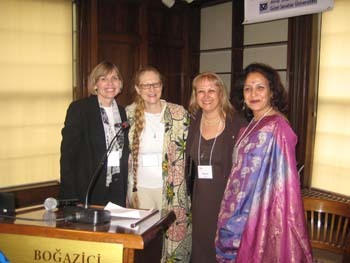 December 2, 2010, 12-2.30 pm: "Understanding and Addressing Humiliation and Conflict," Brown Bag Lunch organized by Gay Rosenblum-Kumar, Senior Secretary of the UN Interagency Framework Team for Preventive Action, 1 UN Plaza, New York, NY, USA. 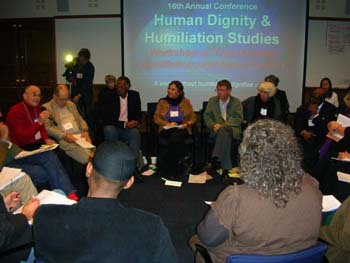 December 2, 2010, 8-10 am: "Understanding and Addressing Humiliation," Breakfast Roundtable organized by Maria Volpe, John Jay College of Criminal Justice, 899 Tenth Avenue, New York, NY, USA. 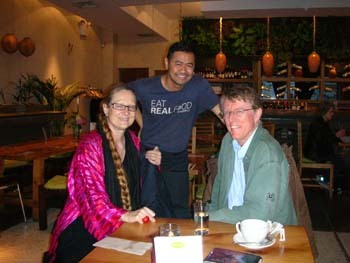 November 22, 2010, with Michael Britton in the Gustorganics restaurant. 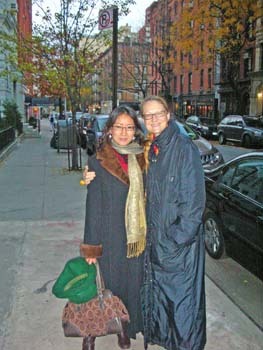 November 21, 2010, with Camilla Hsiung. 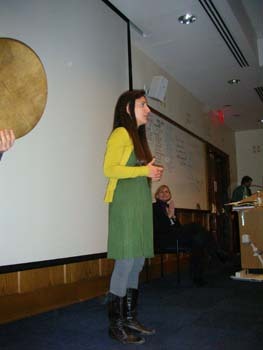 November 20, 2010, Thirtieth Annual E. F. Schumacher Lectures "Voices of a New Economics," New York City. 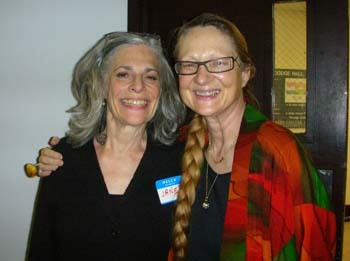 November 19, 2010, NYC-IIPE NYC peace learning community Potluck dinner, Teachers College, with Betty Reardon, Janet Gerson, Tony Jenkins, Dot Maver and many others! 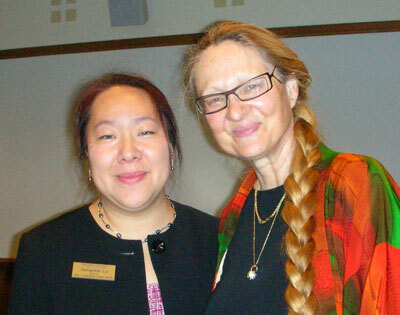 November 16, 2010, with Samantha Lu, director of Teachers College Office of International Student Services, at the Lunch with the President of Teachers College, Dr. Susan H. Fuhrman! 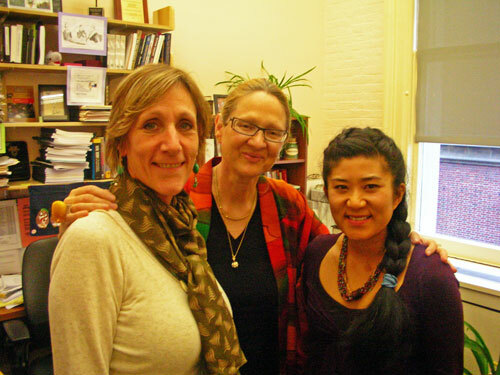 November 16, 2010, with Beth Fisher-Yoshida, Academic Director of a new Master of Science in Negotiation and Conflict Resolution at The School of Continuing Education at Columbia University, and Connie Sun, its Program Coordinator. 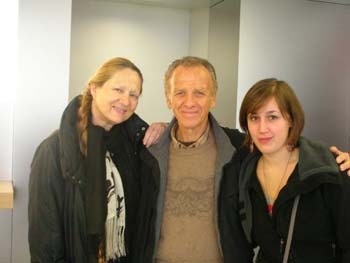 November 14, 2010, with Janika and Victor Zurbel in Manhattan. 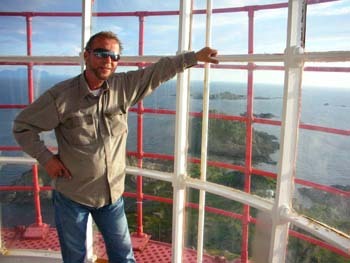 Victor was our guide. He wrote: "The most interesting would be to go to the 'Meat Packing District.' It is the hippest new neighborhood. Start with the Apple Store on 14th St. and 9th Avenue, and then walk to the Westside and go upstairs to the skyline drive and take a walk. 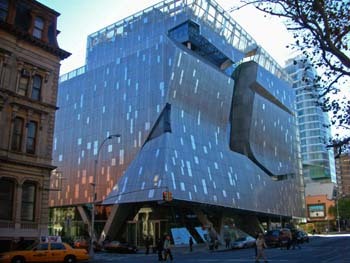 It runs through the most interesting new architecture and you can see the Staue of Liberty, the Empire State Building etc." Please click on the picture or here to see more photos. 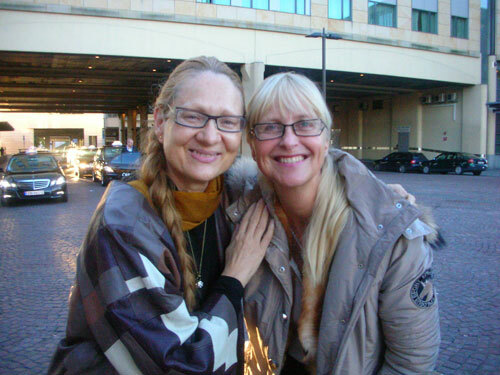 November 13, 2010, with Janika in Manhattan, from Columbus Circle (where a film was rehearsed with a car upside down), to Plaza Hotel at the other end of Central Park, to the Empire State Building, passing Cooper Union, to Mara's Homemade, to Patricia Field, to China Town... From there we took the metro back home. 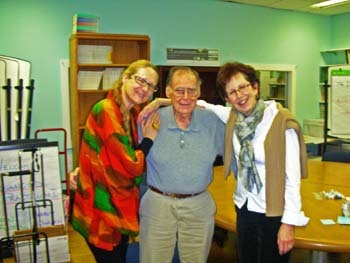 November 8, 2010, with Morton Deutsch and Claudia Cohen at the International Center for Cooperation and Conflict Resolution (ICCCR). 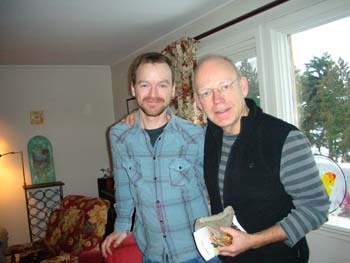 November 6, 2010, with creative genius Victor Zurbel. 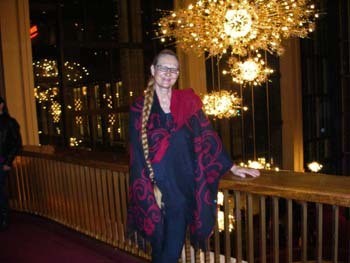 Be humble and you will remain entire"
November 4, 2010, a raining day in New York, Carmen is given at the Metropolitan Opera. 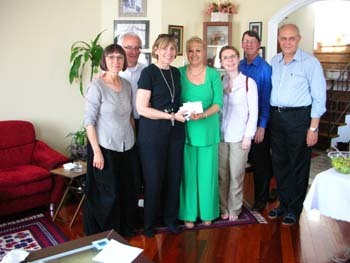 20th-21st October 2010, having the privilege of meeting Margrit Kennedy and Declan Kennedy. 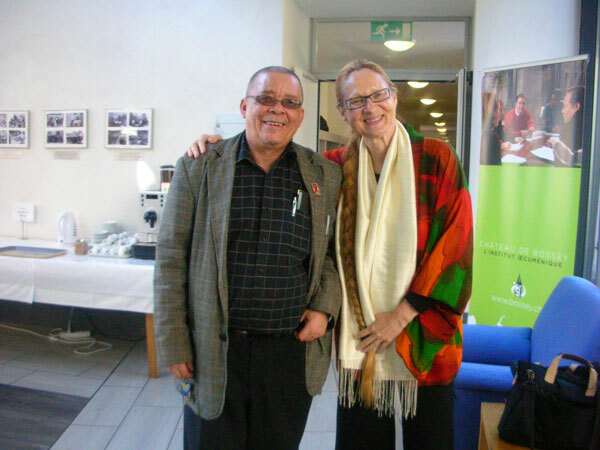 6th October 2010, having the privilege of meeting Paul Isaak, at the Ecumenical Institute at Bossey, an international centre for encounter, dialogue and formation of the World Council of Churches. 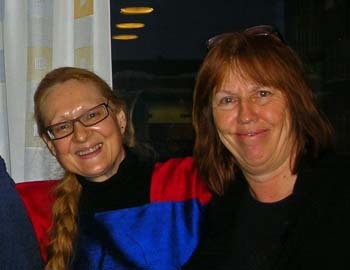 28th September 2010, with dear Ragnhild Nilsen. 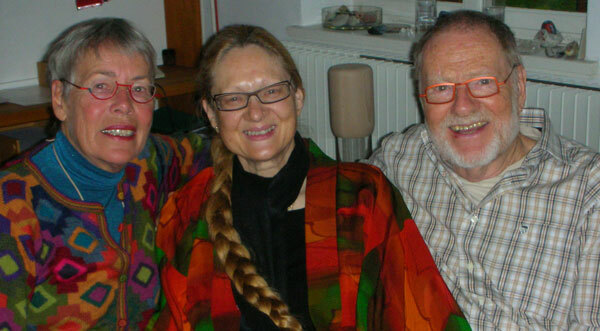 26th September 2010, Barbara and Bob Randall and Helga Arntzen at the Nobel Institute. 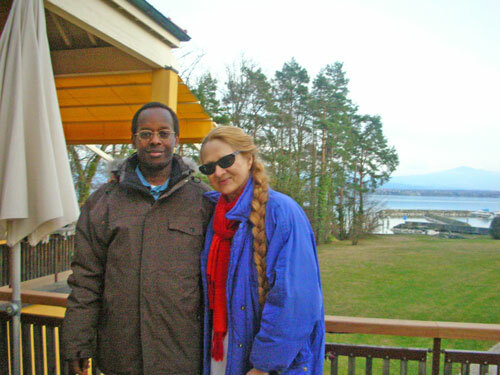 25th September 2010, having the privilege of being with Alicia Cabezudo at the Nobel Peace Prize centenary conference in Oslo, Norway, 23rd-26th September 2010! 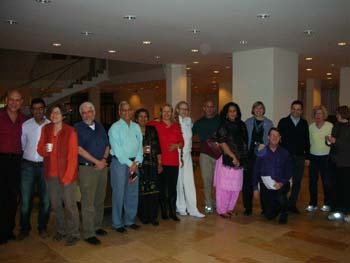 23rd September 2010, Nobel Peace Prize centenary conference in Oslo, Norway, 23rd-26th September 2010. 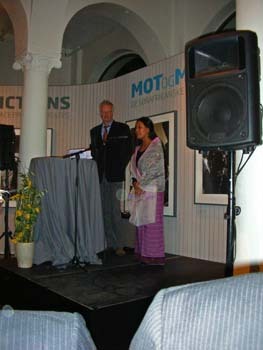 Bina Laxmi Nepram received the 2010 Sean MacBride Peace Prize from Tomas Magnusson, President of the International Peace Bureau! CONGRATULATIONS! 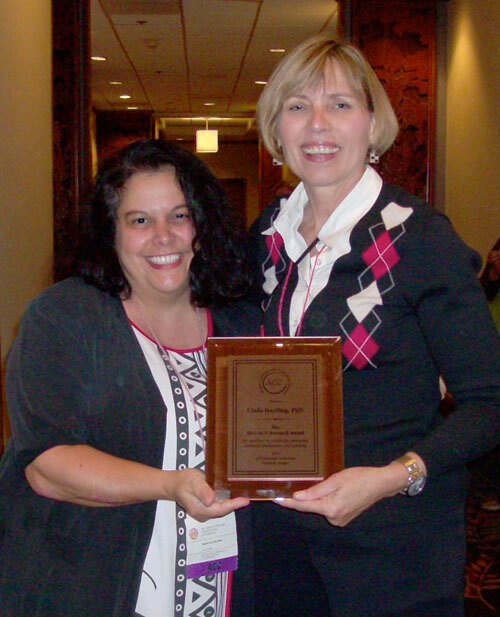 September 18, 2010, Linda Hartling received the Association for Creativity in Counseling Research Award! CONGRATULATIONS! Please click on the picture to see it larger! 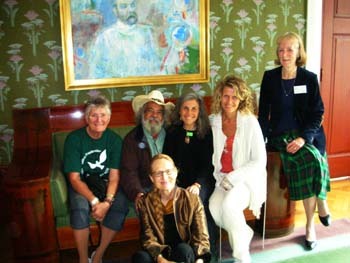 19th September 2010, Pamela Hiley, Director of the Norsk Taiji Senter, seated Bob Randall, Aboriginal Leader from Uluru, Australia, in the Arne Næss Stolen (the chair of Arne Næss, who was a most beloved member in the HumanDHS Global Advisory Board and participant in the 2003 HumanDHS Paris conference together with is wife Kit-Fai). 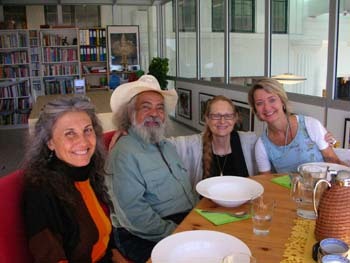 Bob Randall is a member of the Stolen Generations and former Indigenous Person of the Year. 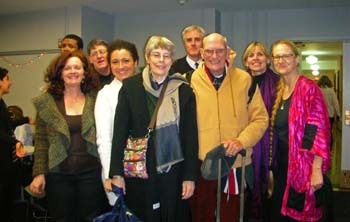 Bob Randall is credited with bringing to light the issue of forced removal of Aboriginal children from their families, in 1970. His song, "My Brown Skin Baby They Take Him Away," written at the time, is described as an "anthem" for the Stolen Generations. 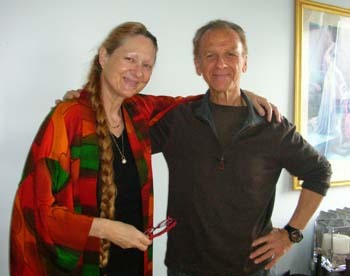 Please listen to Uncle Bob on National American Radio, 17th September, 2010. 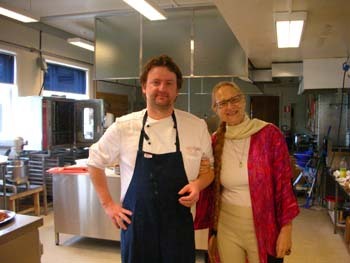 See also the article that I wrote after my stay at Queensland University in 2007. 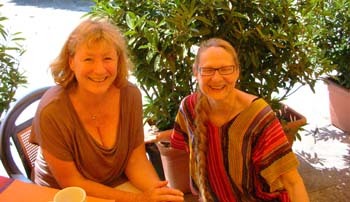 10th August 2010, with Elenor in Rolle! 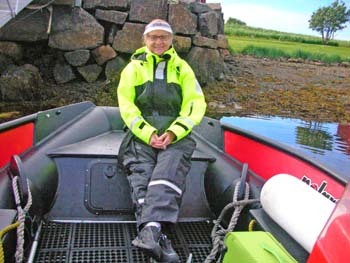 10th July 2010: On my way to Ellen Marie Hansteensen on Litløy fyr. 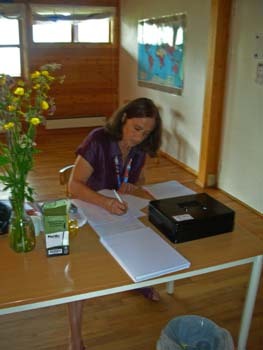 11th July 2010: My first day on Litløy fyr. 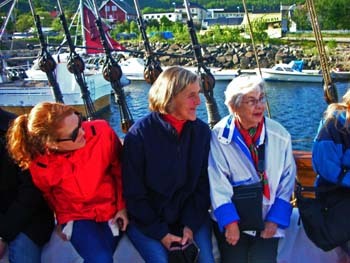 I met many wonderful house guests, and the fishing boat M/K Faxsen came to pick up two guests! And Norwegian television NRK filmed! 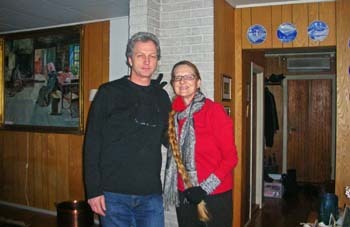 Read more about their last visit in winter at http://www.fyr.no! 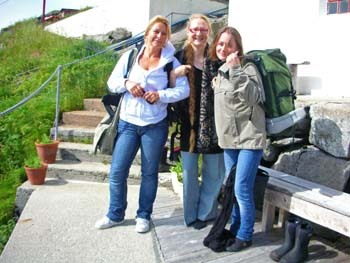 12th July 2010: My second day on Litløy fyr. 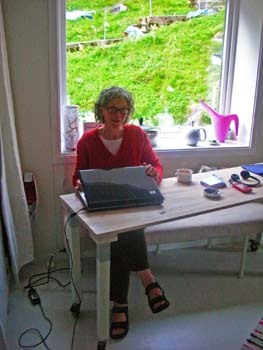 Ellen Marie worked on her computer while storm created heavy sea outside. 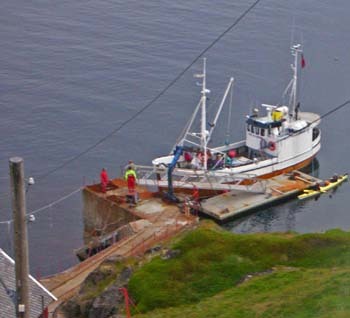 13th July 2010: My third day on Litløy fyr. 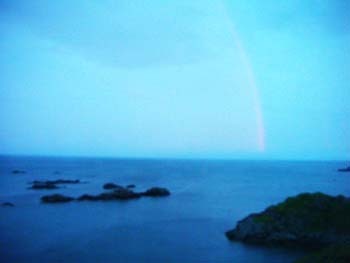 The midnight sun created a sunbow (not a rainbow)! 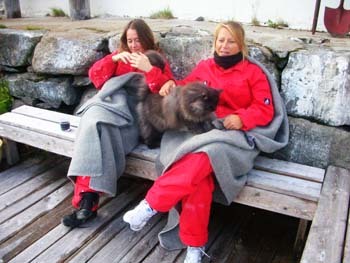 14th July 2010: My fourth day on Litløy fyr. 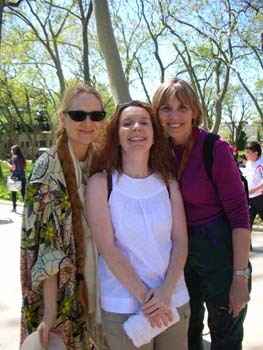 See Linda, Helen, and Sirius on the sunny side of the house! 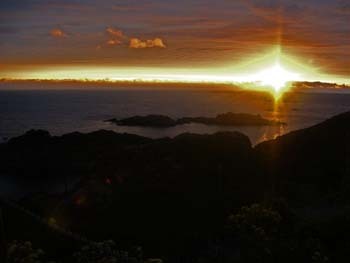 15th July 2010: My fifth day on Litløy fyr. 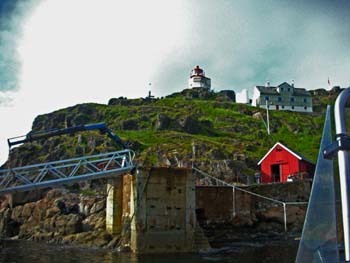 Ellen Marie gave us a guided tour to the lighthouse and explained her plans for the future. Then I went swimming and was astonished that the water temperature was much warmer than I had expected (it did not feel that it was 10 degrees centigrade)! 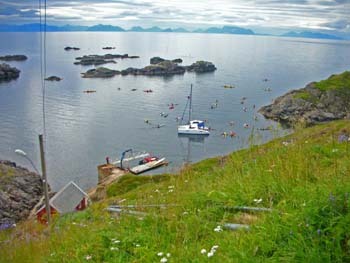 17th July 2010: My seventh day on Litløy fyr. 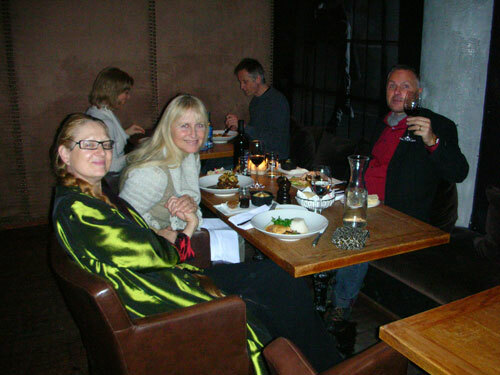 Linda and Helen left, and Torstein came! 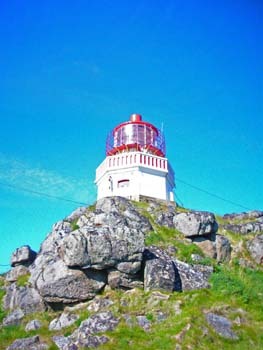 18th July 2010: My eighth day on Litløy fyr. 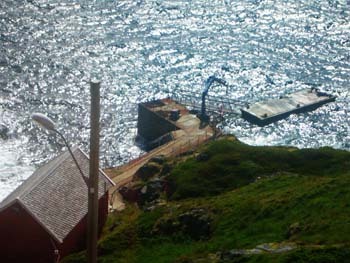 Torstein left in heavy weather, picked up by Rønnaug. 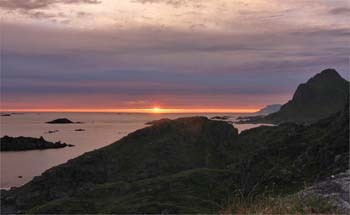 21th July 2010: My eleventh day on Litløy fyr. 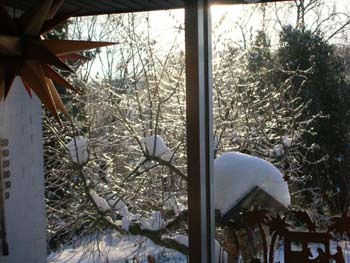 Often, neighbors pass by. 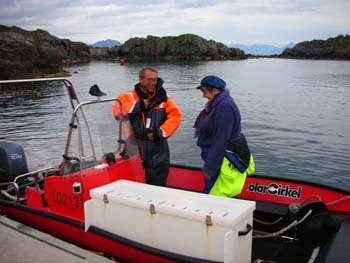 24th July 2010: My fourteenth day on Litløy fyr. 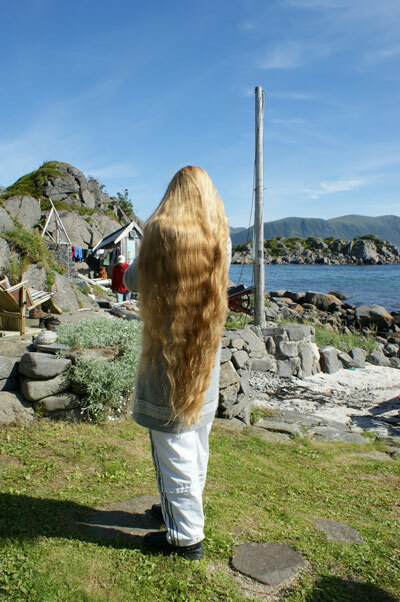 Rapunzel! 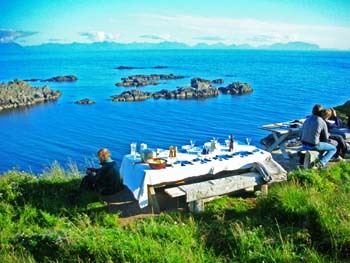 And dining outside! 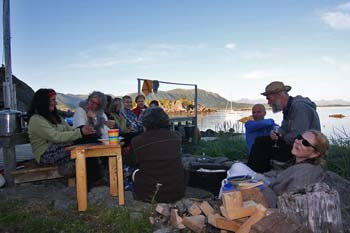 25th 26th July 2010: My sixteenth day on Litløy fyr. 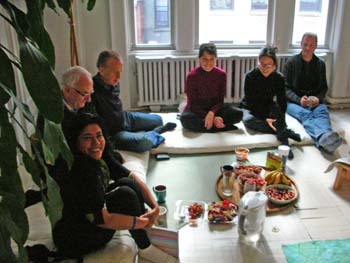 We visited Myriam and Leon and Myriam made this picture! Please click on the pictures above to see it larger. 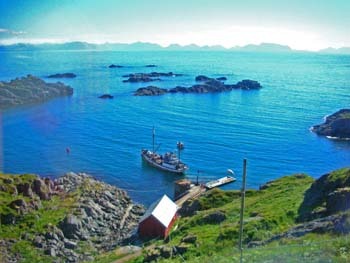 27th July 2010: My seventeenth day on Litløy fyr. 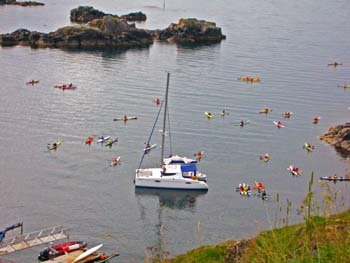 The annual Arctic Sea Kayak Race swang by! Please click on the pictures above or here to see them larger. 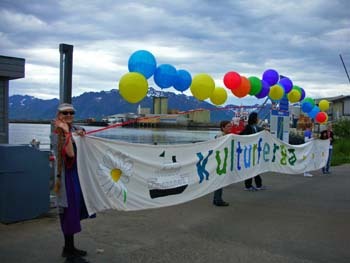 2nd July 2010, Opening of Sommer-Melbu 2010 at the Fish Industry Museum of Melbu. The future of humankind is at stake. In times of crisis, we need people of courage, people who step out of the beaten track of familiarity and look at the situation from a new perspective. 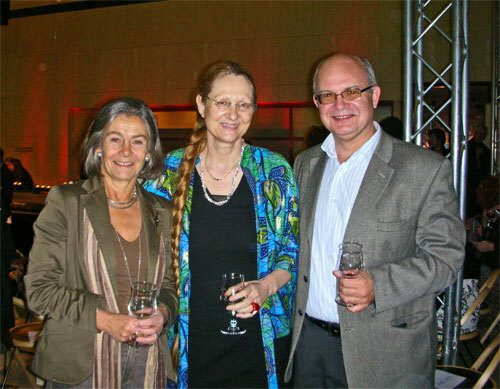 Few people have the global experience and transdisciplinary background that Evelin Lindner brings to this task. 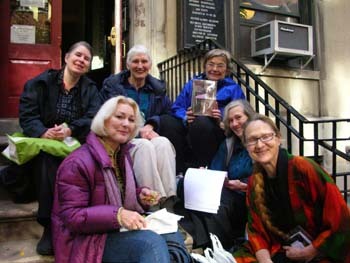 This book is a wake-up call and a guideline for humanity to follow if it wishes to survive. 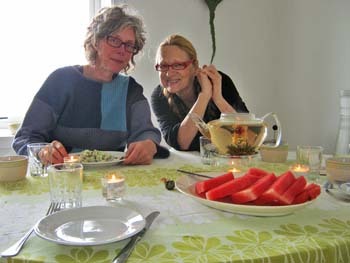 6th July 2010: Betty explained to me the following, and I deeply resonate with her: "What we do know, we do not know in a way that serves our needs. 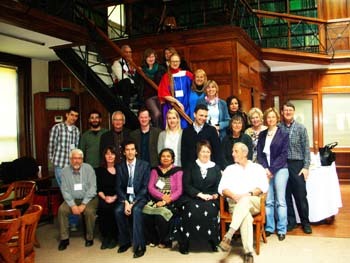 So, we need to know in different ways, and we need to build new knowledge through new ways of knowing. The new knowledge is in the area of designing new realities, which is likely to be done by speculative and creative thinking that would be communally shared and reflected for common formulation that would be tested in a continual process of social invention." 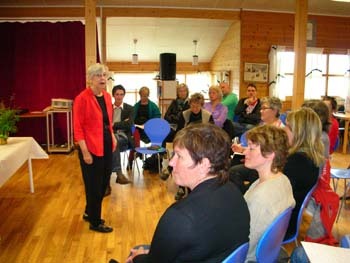 7th July 2010: Conflict Resolution and Dialogue in Close Relationships (Konfliktløsning og dialog i nærmiljø og i nære forbindelser), Cruise med Jekta. 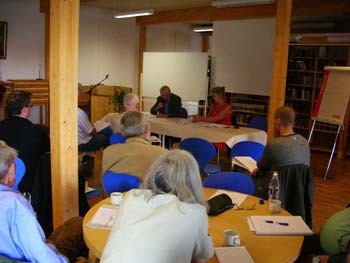 10th July 2010: Philosophy Seminar "What Is it that Hinders Peace and a Culture of Peace?" 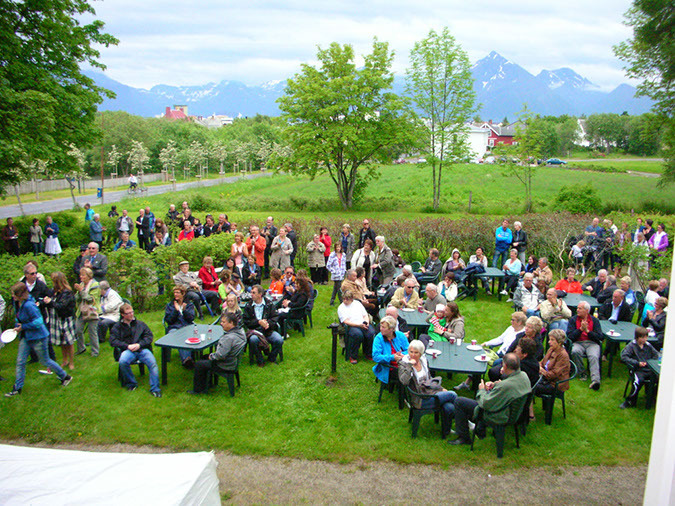 (Filosofseminar 8. - 10. juli: Hva hindrer fred og fredskultur? 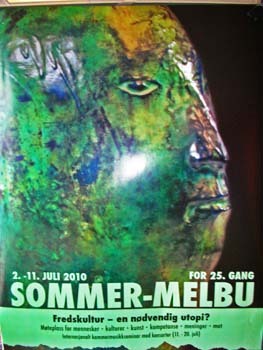 ), and exhibition in the Main Estate (Hovedgården)! 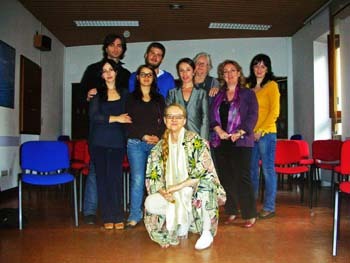 4th May 2010, "The Role of Dignity and Humiliation for Moral Philosophy," lecture given in the course on Moral Philosophy with Professor Francesca Brezzi at the University Roma Tre in Rome, Italy, through the kind introduction by Emanuela C. Del Re. 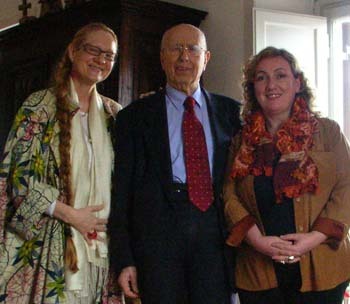 4th May 2010, dear Emanuela C. Del Re gave me the great honor of meeting Luigi Vittorio Ferraris. 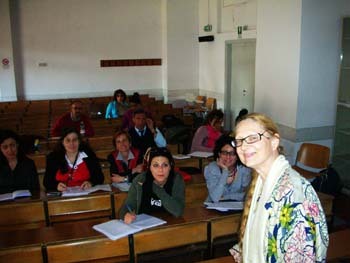 5th May 2010, "The Role of Dignity and Humiliation for Sociology," lecture given in the Ph.D. course "Teoria e Ricerca Sociale (Theory and Social Research)" of Professor Maria Immacolata Macioti at the University La Sapienza in Rome, Italy, through the kind introduction by Emanuela C. Del Re. 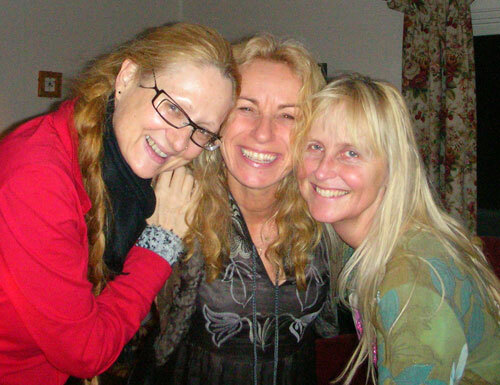 5th May 2010, dear Emanuela honoured me by asking Donna Grazia the favour to repair my African coat despite of being very pressed by time! 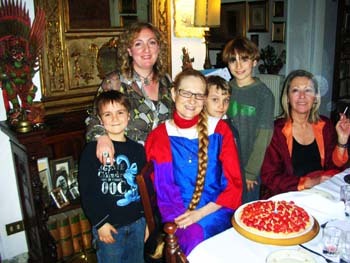 7th May 2010, dear Emanuela C. Del Re prepared a wonderful birthday surprise for me! Thank YOU, dearest Emanuela!!! 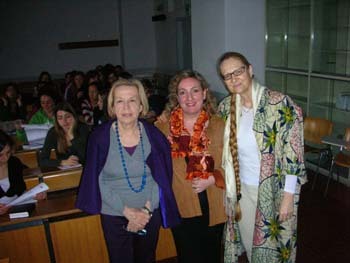 7th May 2010, "The Role of Dignity for Gender Relations," lecture given in the course for Master's Degree students in Gender Studies of Professor Francesca Brezzi at the University Roma Tre in Rome, Italy, through the kind introduction by Emanuela C. Del Re. 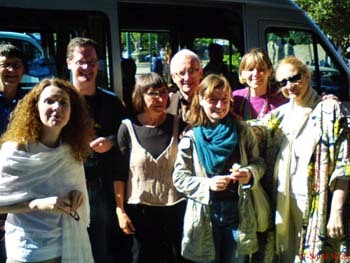 The precise name of the course: Master in formatori e Esperti in pari opportunità "Women's studies e identità di genere." 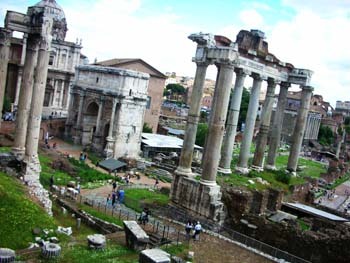 8th May 2010, dear Emanuela C. Del Re (Octavia) and her family took the time to show me their breathtaking Rome, so immensely rich in history and meaning! Thank YOU, dearest Emanuela!!! It was wonderful to see the Vatican, Castel Sant'Angelo, the Colosseum, the Fori, the Capitol, Rome's Jewish ghetto, your Porta Octavia, dear Emanuela, and so many other wonderful places! 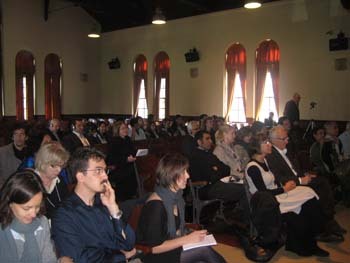 On 28th April 2010, on Day One of the conference, Dr. Kadri Ozcaldiran, Rector of Boğaziçi University welcomed everybody. • Please click on the pictures at the top or here to see all the photos of Day One from Evelin's camera. • Please click on the pictures at the bottom or here to see all the photos of Day One from Hayal's camera. 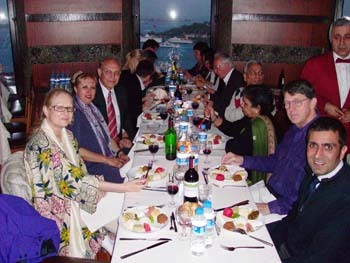 28th April 2010, Gala Dinner at the Vakiftepe (Social Building) of the Istanbul Technical University, overlooking the Fatih Sultan Mehmet bridge. 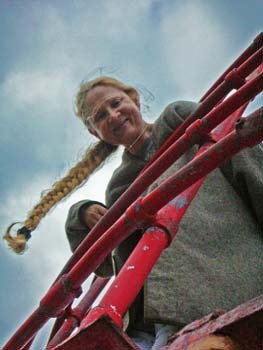 • Please click on the picture on the right or here to see all the photos from Sophie Schaarschmidt's camera. 29th April 2010, Day Two of the conference. • Please click on the pictures on the left or here to see all the photos of Day Two from Evelin's camera. • Please click on the picture on the right or here to see more photos from Linda's camera. 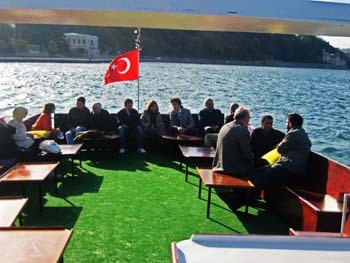 29th April 2010, Bosphorus Boat trip with fish and bread, supported by the Sariyer Municipality. We extend our warmest thanks! • Please click on the picture on the left or here to see all the photos from Evelin's camera. • Please click on the picture in the middle or here to see all the photos from Hayal's camera. 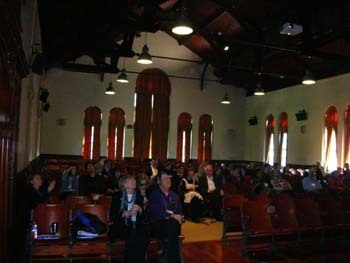 30th April 2010, Public Event on Day Three of the conference. 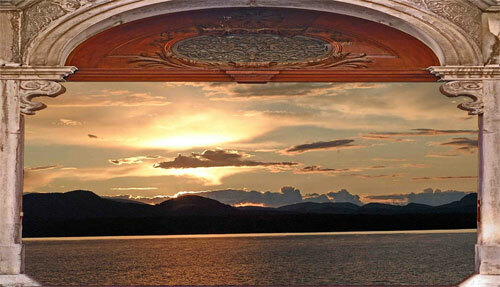 • Please click on the picture at the bottom or here to see all the photos from Linda's camera. 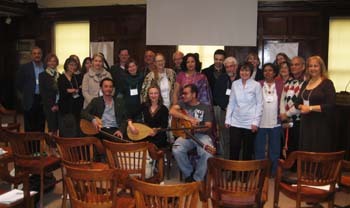 30th April 2010, after the Public Event on Day Three of the conference, we attempted to enjoy the Covered Bazaar and unexpectedly had a special Open Space Session on the dignity - or rather the lack of dignity - in contemporary economic arrangements with Nebil Basmaci. • Please click on the picture or here to see more photos from Linda's camera. 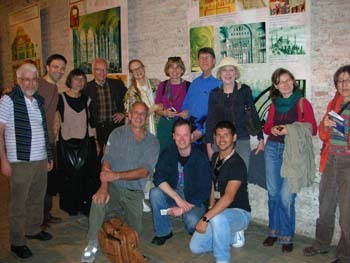 30th April 2010, after the Public Event on Day Three of the conference, we enjoy the Covered Bazaar and the Galata Tower dinner. 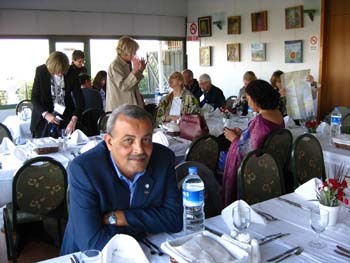 1st May 2010, Kilyos hotel. 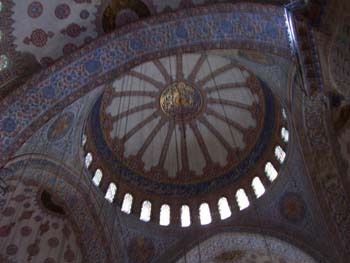 1st May 2010, Sultanahmet Circle with German Fountain, Column of Snake, Blue Mosque, St. Sophia Palace and Mosque. • Please click on the pictures at the top or here to see all the photos from Evelin's camera. 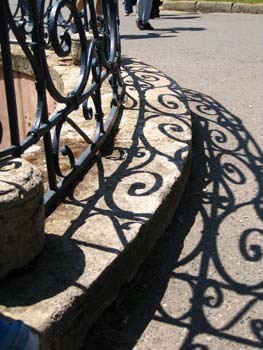 • Please click on the picture in the middle or here to see more photos from Linda's camera. • Please click on the picture further down or here to see all the photos from Sophie Schaarschmidt's camera. • Please click on the picture at the bottom or here to see all the photos from Ardian Adžanela's camera. 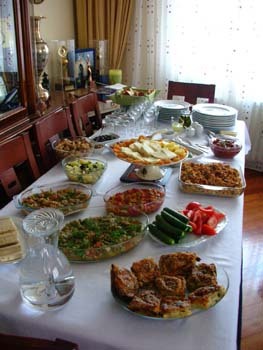 2nd May 2010, Turkish hospitality! 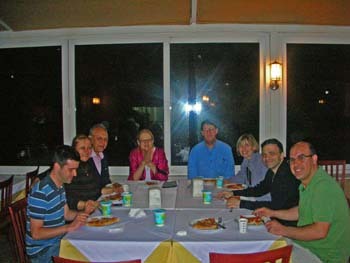 Hayal Köksal opens her home, and we say good-bye to dear Arif at Kilyos! 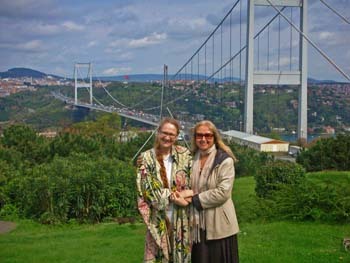 On 20th April 2010, after 4 nights being stranded in Amsterdam, Evelin finally arrived in Istanbul, lovingly welcomed by Hayal Köksal, the unbelievably caring and skilled convener of our conference. 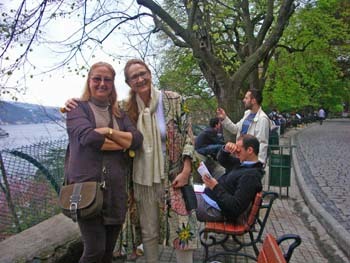 Dear Hayal arranged something extraordinary, namely, that I could stay during the first days prior to our conference in the famous Kennedy Lodge on the campus of Bogazici University in Istanbul. 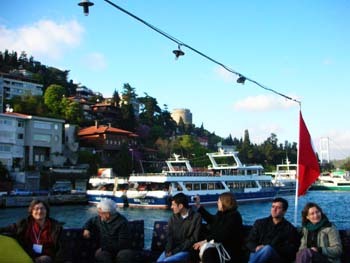 It is a large house with a marvelous view of the Bosphorus. 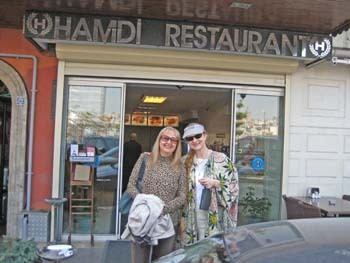 Then she invited me for my first lunch in Turkey to the wonderful Takanik Balik restaurant. 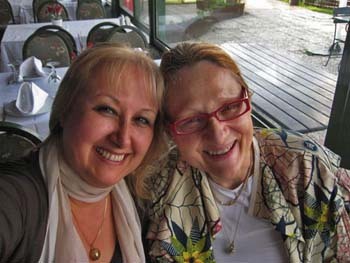 Thank YOU, dear Hayal, for such loving care! 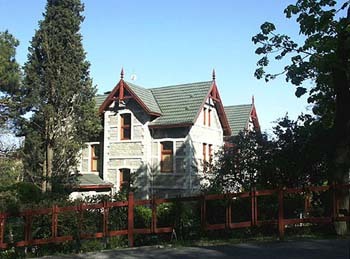 Kenney Lodge, overlooking the Bosphorus, in between two bridges (Fatih Sultan Mehmet bridge in the north and Bogazici bridge further south). 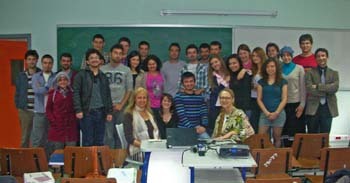 On 21st April 2010, Hayal introduced me to her students at Boğaziçi University, who study to become teachers. 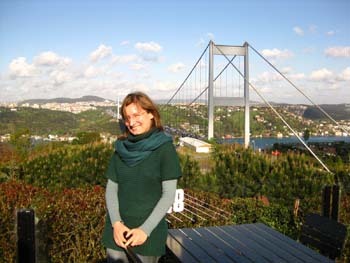 Afterwards, Hayal invited me to the Vakiftepe (Social Building) of the Istanbul Technical University, overlooking the Fatih Sultan Mehmet bridge. 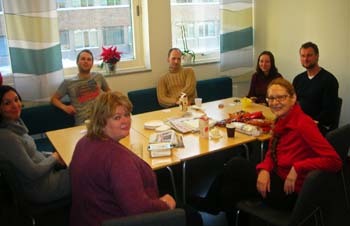 There, we worked on the programme of our conference! • Please click on the pictures at the top or here to see more photos from Evelin's camera. • Please click on the pictures at the bottom or here to see more photos from Hayal's camera. 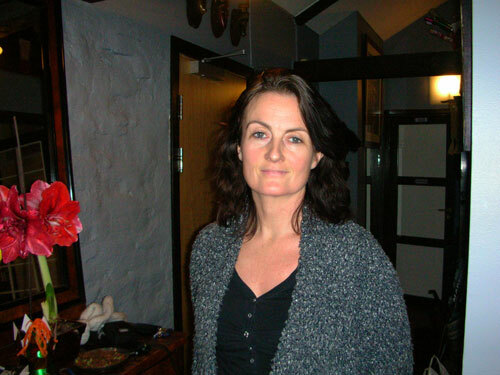 See also Hayal's blog! 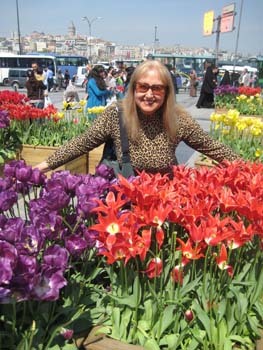 On 23rd April 2010, Hayal took me around in Istanbul, from the Children's Day celebrations to the Hamdi restaurant, and the tulips of Turkey. 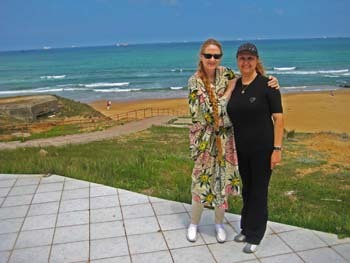 Please click on the picture above or here to see more photos from Hayal's camera. 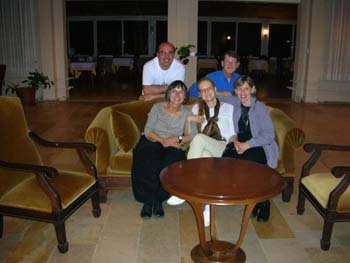 25th April 2010, after a wonderful weekend at Hayal's home, she took Evelin to see Kilyos hotel. 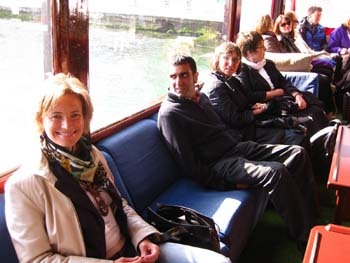 26th April 2010, first arrivals! 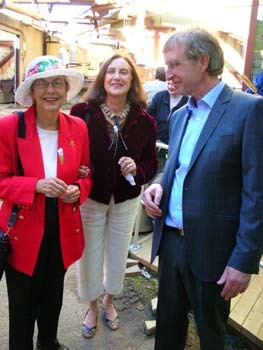 See Linda Hartling, Rick Slaven, and Ardian Adžanela. 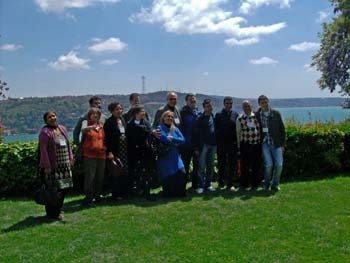 Hayal Köksal and her students (see Uğur Akgün and Salim Ergene on these pictures) helped wherever they could. 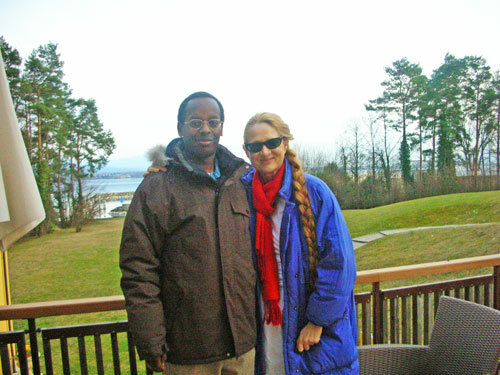 See also Arif, who wonderfully cared for us in Kilyos hotel! Thank you to you all!!! 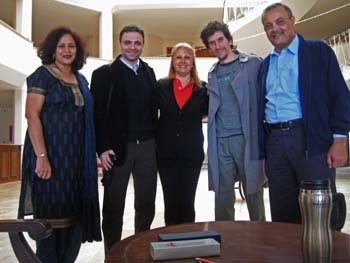 On 27th April 2010, Vineeta Kamran was among the first to arrive, and also Younis Al Khatib, President of The Palestine Red Crescent Society joined us. 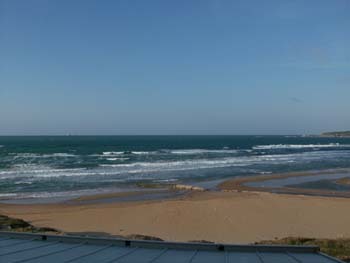 • Please click on the picture in the middle or here to see more photos from Hayal's camera. 22nd March 2010, with Jean-Damascène Gasanabo (Damas). 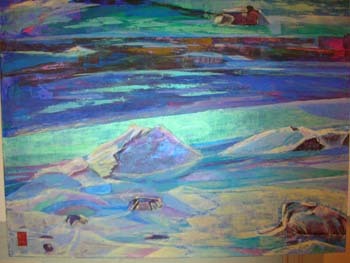 Please click on the pictures above to see them larger. 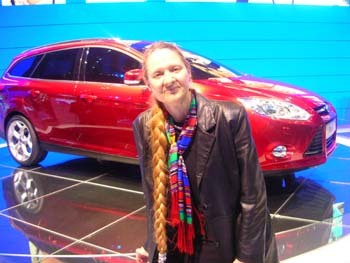 13th March 2010, 80th International Motor Show, March 2010 Geneva. 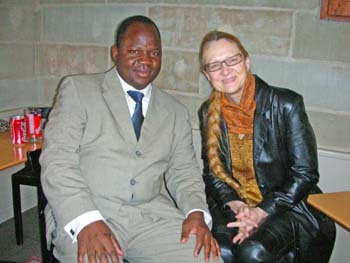 21st February 2010, meeting with Tanga Kabore. 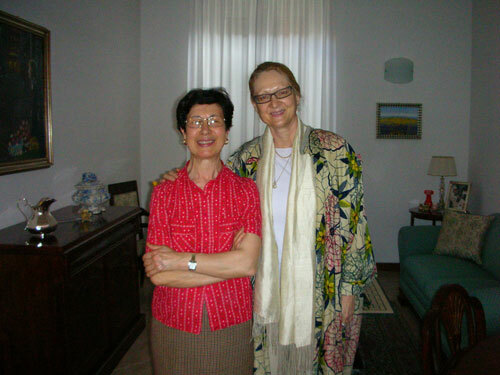 3rd February 2010, meeting with Elenor. 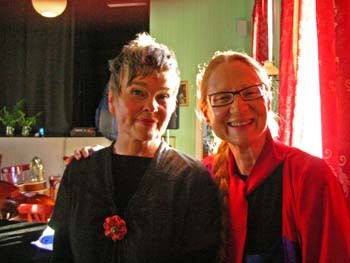 23rd January 2010, with Heidetraut von Weltzien Høivik and Maria Dahle in Oslo. 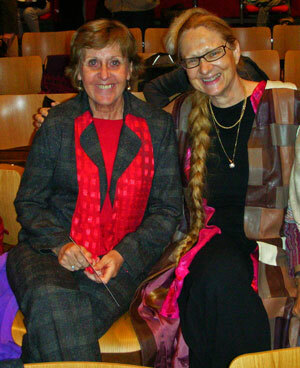 22nd January 2010, with Maria Rosvoll in front of the Center for Studies of Holocaust and Religious Minorities in Norway, where we had our 2008 HumanDHS conference. 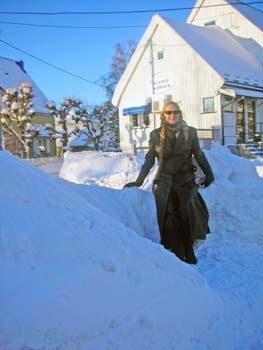 Note that Maria manages to make the snow ball fly on the picture! Please click on the picture above or here to see more pictures. 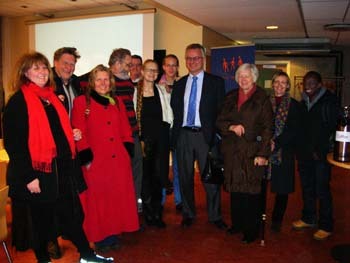 20th January 2010, with Trond-Viggo Torgersen and Arne Olav Hageberg. 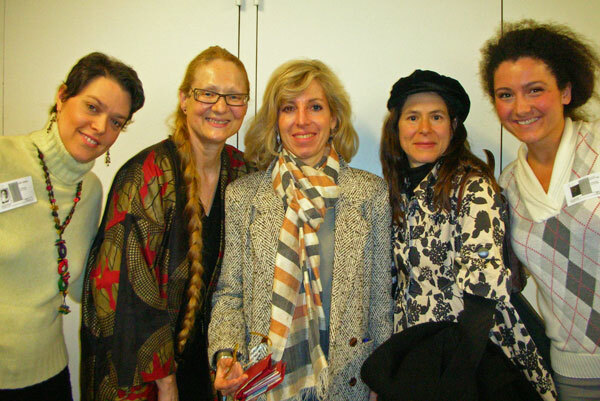 19th January 2010, with Anne-Katrine Stabell Hagelund and Ragnhild S. Nilsen. 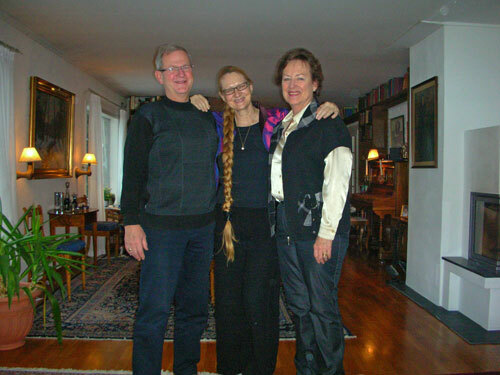 16th January 2010, with Ragnhild S. Nilsen and her husband. 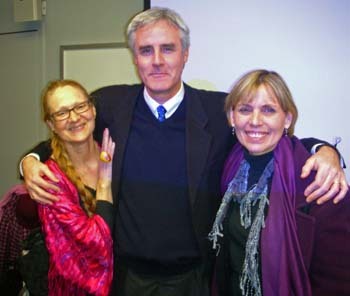 15th January 2010, The Relevance of Dignity and Humiliation for Peace Research, Lecture at the International Peace Research Institute, Oslo (PRIO) and, afterwards, Norsk Taiji Senter. 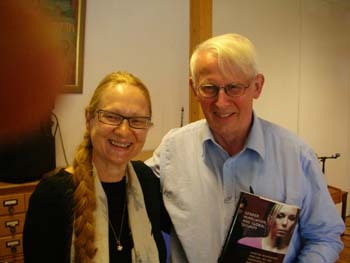 Please see also the video-taped introductory lecture Dignity or Humiliation: The World at a Crossroad, held at the Department of Psychology at the University of Oslo, Norway, on 14th January, 2009. 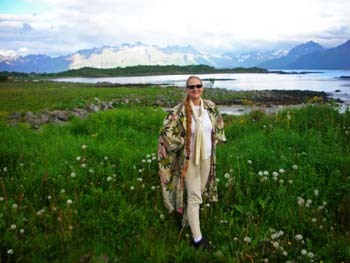 Lecture at the Department of Psychology/Psykologisk institutt at the University of Oslo, Norway (Harald Schjelderups hus, Forskningsveien 3, Auditorium 3, as part of PSYC3203 - Anvendt sosialpsykologi), 10.15-12.00. Please click on the picture above or here to see two more photos. 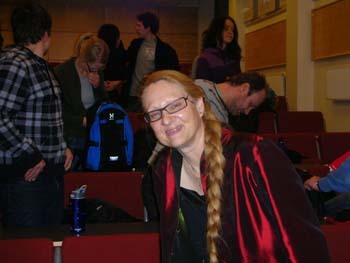 11th January 2010, The Role of Anthropology for Theorizing Dignity and Humiliation: How Global Humiliation Affects the Citizens of Increasingly Diversified Societies, Lecture at the Cultural Complexity in the New Norway (CULCOM) programme at the Department of Social Anthropology/Sosialantropologisk institutt at the University of Oslo, Harriet Holters hus, 2nd floor, invited by Thomas Hylland Eriksen and Elisabeth Eide. Please click on the left picture above or here to see more photos from Evelin's camera. Please click on the pictures or here to see more photos. 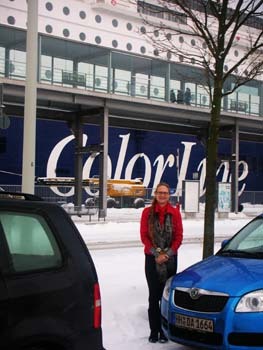 7th-8th January 2010, with Color Line (MS Color Magic) from mainland Europe (Kiel, Germany), to Oslo, Norway, a journey of 20 hours. 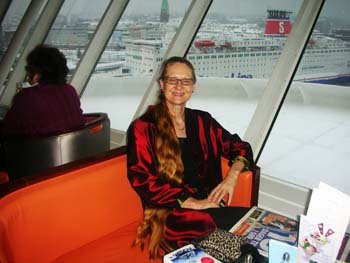 The journey begins with waiting (before driving onboard), then the ship leaves the harbour. Arrival is next morning at around 10.30. 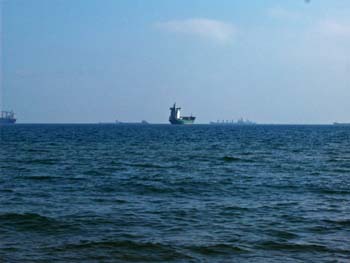 In Kiel temperatures were at ca. minus 10 degrees Celcius, in Oslo at almost minus 20 degrees (during the night temperatures had fallen to more than minus 40 degrees in several places in southern Norway). I have a tradition of celebrating when arriving on board of the ship with the one beer that I usually drink per year (sometimes two). Upon arrival in Oslo, I always immediately drive to the Department of Psychology at the University of Oslo. 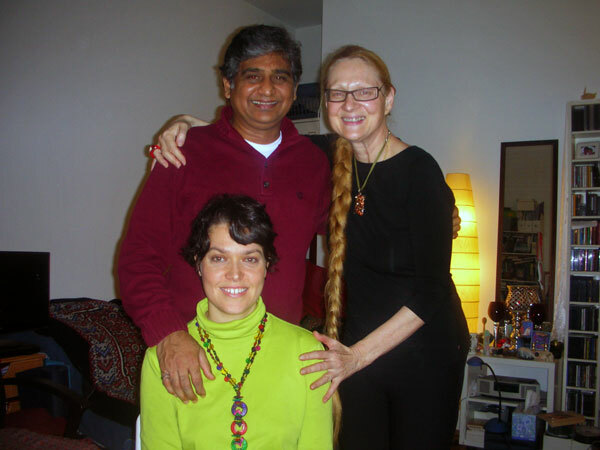 I am deeply thankful for the help and support I reveice from everybody there! My computer got the brilliant expert attention it urgently needed (Egil and Øivind rescued the sound card: HOORAY!!! ), and my snail mail was waiting for me that had been faithfully and kindly collected for me during the past months (note: please do not send snail mail to me expecting quick responses!). 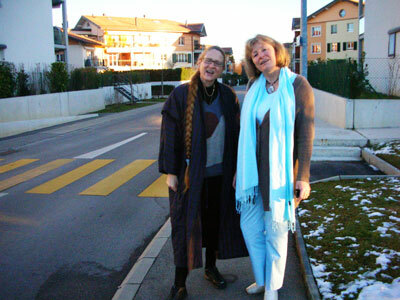 Later the same day, I had a chance to touch ground with our esteemed Global Advisory Board member Hroar Klempe from the University in Trondheim. 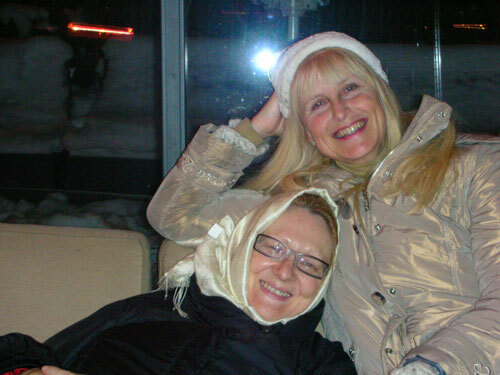 9th January 2010: Enjoying winter in Oslo-Ekeberg! New Year 2010 in my parents' house in Europe.